People who skydived with me called me Cannonball, everybody else knows me as Todd. My name comes from my first jump instructor. It's a lot like calling the bald guy Curly. I am tall and skinny, so I fall slowly, opposite of a cannonball. Some have thought it had to do with my male pattern baldness. That's not it, but as the years go by, it looks more and more like it does, heh. After college, I moved to Texas and there I found skydiving. I jumped for 6 years, with a total of about 850 jumps, though I haven't jumped for about 15 years now. This is a picture of me shooting video of my former team 4ce Majeure. Finally, a picture of a Side Flaked Donut exit (right out of the plane) while practicing at Skydive Houston. This was right before Nationals. My line from the party after the 4-way competition was over: "I will never drink that much again..." But we've all said that one at one time or another. I quit the job I had in Texas and moved to California. I worked for 2 years doing electronics repair, but then found a job that I REALLY believe in. I have always been familiar with Linux as an alternative to Windows 95/98, but I didn't really get deep into it until I moved here to Los Angeles. Since then I dove into the Linux waters and am learning a great deal. I was hired by MandrakeSoft doing tech support and consulting. It was a great opportunity to expand my skillset and to work on and complete projects that I would have never had access to working alone. I have since moved on, but still gauge every job I come across to that one. 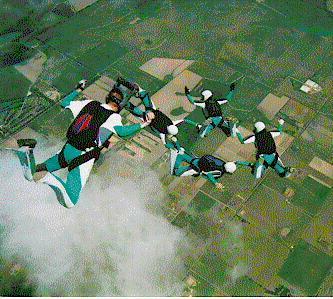 When first in Los Angeles, I would skydive at Skydive Elsinore in the city of Elsinore, about an hour away. I also have found that Perris Valley Skydiving is another cool place. 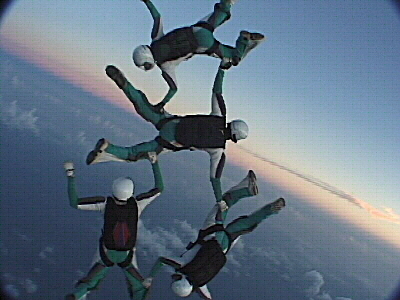 My only complaint is that I don't skydive as much as I used to, e.g. at all. In reality, I haven't jumped for over 15 years now, so for all intents and purposes I'm a non-jumper now.